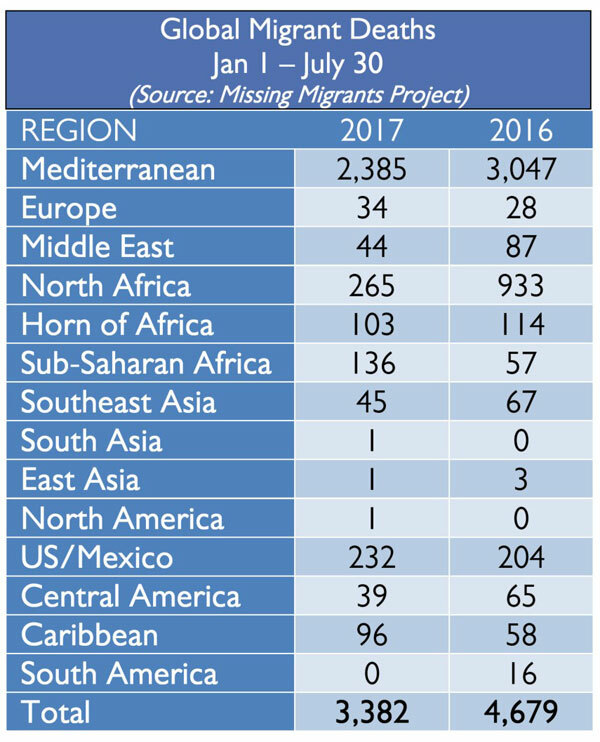 Geneva – IOM, the UN Migration Agency, reports that 114,287 migrants and refugees entered Europe by sea in 2017 through 30 July, with almost 85 per cent arriving in Italy and the remainder divided between Greece, Cyprus and Spain. This compares with 256,828 arrivals across the region through 30 July 2016. IOM Rome reports 10,781 sea arrivals to Italy this month through 30 July. That figure trails the full July totals for each of the past two summers by nearly 13,000 (see chart below), highlighting a trend that IOM has observed of slower traffic to Italy during mid-summer, and fewer deaths (approximately half of those recorded in July 2015 and 2016). 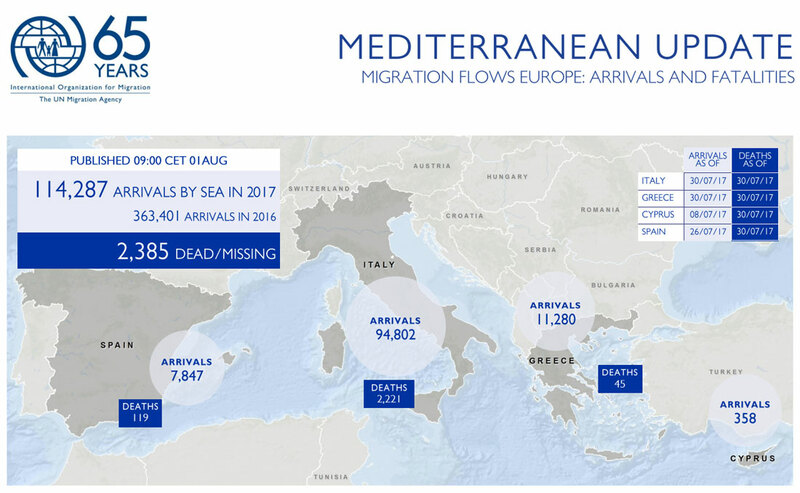 Nonetheless, for the year to date, 94,802 arrivals to Italy remain slightly ahead of either 2015 or 2016 totals. IOM Spain’s Ana Dodevska reported Monday (31 July) that 13 people were rescued off the Spanish coast; 39 on 30 July and 158 on 29 July. She said among those rescued on 29 July suffered burns and were dehydrated. These latest arrivals bring the total number of men, women and children coming by sea to Spain in 2017 to 8,157. IOM Libya reports that on 30 July, 48 migrants were rescued off Azzawya by the Libyan Coast Guard. So far in 2017, 11,451 migrants have been rescued in Libyan waters. IOM Athens reported Thursday that 497 migrants and refugees arrived at various Greek locations (Samos, Lesvos, Chios, Rhodes, Megisti) between 27 and 30 July. The total number of arrivals by sea to Greece as of 30 July is 11,280. This compares with 160,233 at this time last year. The latest fatality in the region was reported on Thursday (27 July), after a boat capsized off the coast of Izmir, Turkey, killing seven (two women and five children), the first fatalities recorded in the Eastern Mediterranean since 24 April. These deaths bring the total of fatalities in the Mediterranean in 2017 to 2,385. Although this figure trails the number of deaths (3,047) recorded at this time last year, it nonetheless marks the fourth consecutive year migrant deaths in the Mediterranean Sea have exceeded 2,350. 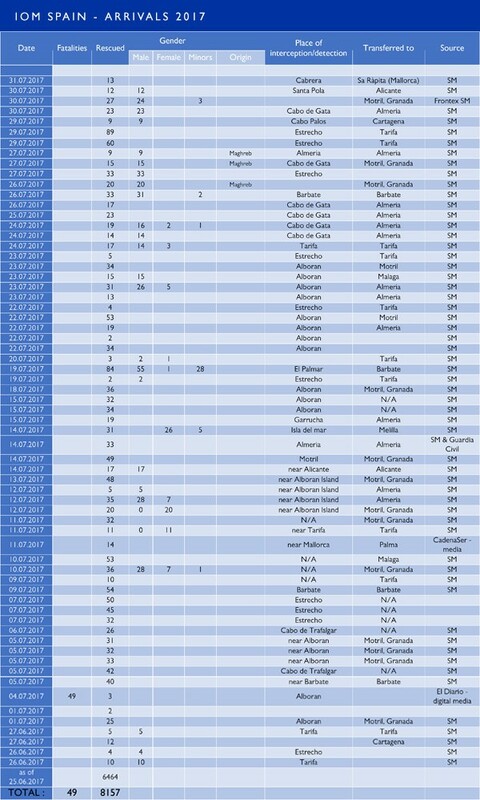 Among the newly confirmed fatalities from MMP are: the drowings off Izmir, one drowning along the US-Mexico border and eight deaths at the Syrian-Turkish border.